Walking home from a great day spent with my friend Aina (Remember the girl with all the talent and charm?) 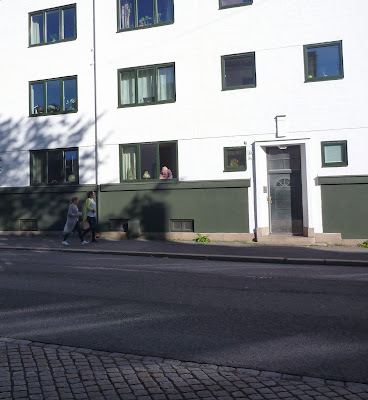 and her cool little brother, I had to take a picture when I passed this great sight: An elderly man, just hanging out of his window in the sunshine, looking at people and cars passing by. I don't think he talked to the girls, but it seems he at least made eye contact with one of them. I believe good architecture will do this to a city. Windows which open up wide encourages people to look out unto the outside and get some real sunshine on their skin. The wall is pierced by the sudden gap in the facade, and a potent meeting between private and public takes place. A road without too many cars is nice to look at, while the trees across tha road cast an interesting shadow. The street becomes a nicer and more interesting place to walk, and so a few people might choose to not take the car. Urban magic.